Our clothes are in constant contact with bacteria throughout our day-to-day activities, for example through contact with contaminated surfaces, other people and our own bodies. Bacteria can spread from one fabric to another in the laundry basket, from the washing-machine drum to the next load. Some of these bacteria can survive following the wash cycle. When it comes to certain laundry loads such as children's clothes or sportswear, you want to eliminate bacteria that may cause illnesses and create lingering bad smells. But detergents alone don't actually eliminate all bacteria. 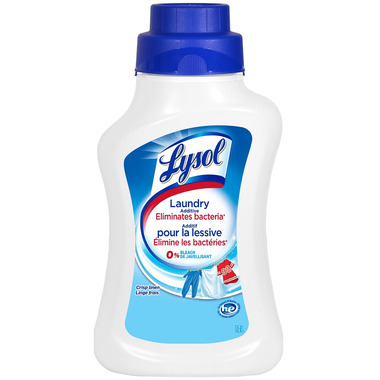 Introducing Lysol Laundry Additive specially designed to eliminate bacteria in laundry. Simply add Lysol Laundry Additive to your fabric conditioner compartment and use as directed. It does not contain any chlorine bleach and even works in cold water so is safe to use on most fabrics including whites, colors and darks. A must have - especially if you share a laundry room in an apartment building or do your laundry at a laundromat. Clothes smell fresh and clean and actually ARE fresh and clean - sanitized.